Integrity: sincerty; completeness, wholeness; an unimpaired condition. What I want to share with my fellow WFN members is an incident which happened by shear accident at a Tournament and how my fishing partner and I handled it. It is not an easy report to write but one that I feel I should share incase you ever find yourself in a situation like this. So here goes. 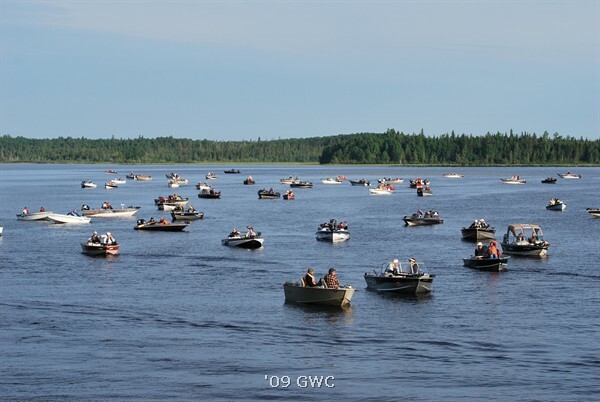 My fishing partner Craig and I headed to Geraldton, Ontario to pre fish for the up and coming Walleye Tournament that was held on June 23 and 24 on beautiful Kenogamissis Lake. During the week we had covered a lot of water and had figured out a pattern for the tournament. Saturday saw us starting off at our number one spot. With no wind at all and only one weighable fish after an hour we decided to head to a place were we knew we could catch our limit while we waited for the wind to blow. After arriving at the spot we had our limit in the boat within twenty minutes. They weren't monsters by any means but a limit none the less. Craig snagged for the third time and had to retie jigs onto his rods. We notice a boat heading our way. No big deal right? As our boat drifted and I was still casting, suddenly wham, a better fish hit. It found it's way into the landing net and then into our livewell. The boat saw us catch the fish and turned around, heading away from us. We kept casting to the spot were the fish I just caught with no luck. As we started heading back up the shoreline the same boat was coming back down. As the boat got closer we noticed that the team was a grandfather with his grandson. Craig cracked a joke to them that we were leaving the area so the fish were theirs now. As we all got a chuckle out of it, the grandfather asked us if the boundary line was just right there. We then commented that we weren't sure and left to our next spot, still waiting for the wind to blow. When we arrived at our third spot, Craig looked up the tournament boundary lines. Craig had a look on his face when he showed me where they were. It was like getting the wind knocked out of you. We were a hundred to two hundred feet past the tournament boundary lines. We new what we had to do after trying to fish some more and talking about it. As a team, the decision was made, without any doubt in our minds we were on plane heading back to weigh in. When we arrived at the weigh in we asked to speak to the Tournament Chair Person. The volunteer went for the Chair Person, bring her to our boat. We started explaining what just happened and showed her on our plot trail were it happened. The Chair person asked us how many fish we had caught past the boundary in which I replied, only one, our largest. The Chair person asked us to release it, weigh in our other five and call it a day but we could still fish on Sunday. After loading the boat, on our ride back to the cabin we talked about the chair persons decision about fishing on Sunday. Once at the cabin and talking for awhile, I could see how we were both feeling and we made the decision that we would disqualify ourselves from the tournament. On our ride over to weigh in, both of us were feeling better about what we going to do. After talking to the Chair Person that we were Disqualifing ourselves for breaking the rules, she shook our hands and asked if we would be back next year. Without any hesitation, at the same time we replied defintly. A smile came upon our faces as we turned and walked away. On our way home we talked about how easy the decision was to make and it was the only one to make. I hope you enjoyed reading this report as it was not written for any other reson but to just share my experiance with my fellow WFN members.